Paying a little extra attention to ewes in the month or so after lambing can pay real dividends, not just for the ewes, but for their lambs and further ahead for the condition of the ewes for tupping the following autumn. That is the view of Dugdale Nutrition’s sheep specialist, John Hickson. “The focus in the run up to lambing, during lambing and post lambing is very much on the lambs. “I am not suggesting that on any well run farm the ewes are neglected once they have lambed, but I do feel, in many cases, just a little extra attention has real benefits in ewe condition and welfare as well as profitability. “Blocks are a useful thing for the first week or so on grass after lambing to avoid mismothering. They need to be high quality with plenty of undegraded dietary protein in them. It then depends on grass growth and quality but I think ewes continue to need feeding with compound until sufficient grass is available. “The general guide for compound feeding about 0.5kg per lamb – 1kg per head per day for a ewe with twins. Where possible this should be split between two feeds a day. Then as grass growth increases, supplementary feeding can be reduced. “Also from a practical point of view, if you are feeding them you see them every day so you can quickly spot any problems. “Research has shown mastitis or black bag can be linked to poor nutrition. If feed is not good enough and the ewe is short of milk with lambs trying to suckle and pulling on the teats making sores which allows the mastitis bug in. “Supplementary feed needs to be a good quality ration with plenty of energy and about 18-19 per cent good quality protein. After lambing ewes are not normally keen to eat hay or silage but prefer to graze so clean fresh fields are needed. 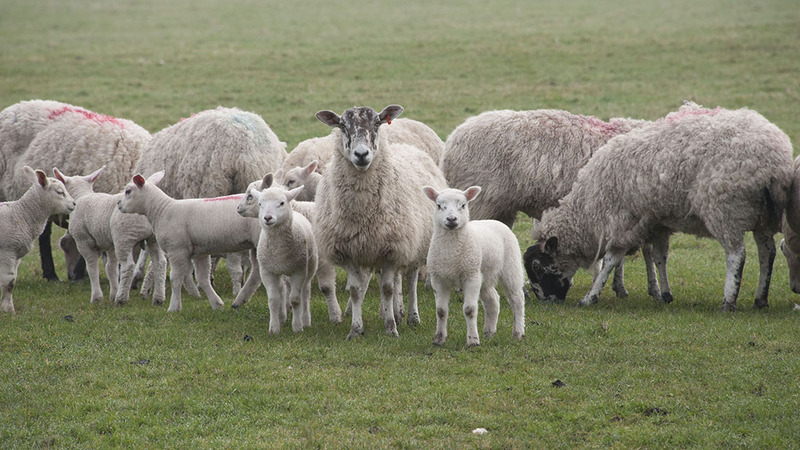 Mr Hickson sees the key potential problems in the post-lambing period being black bag (mastitis) and staggers, (magnesium deficiency), as more grass becomes available. Here it is important to get the mineral profile right with the minerals incorporated into feeds including blocks, he says. It is also important not to use potash in spring fertiliser applications as this restricts the availability of magnesium within the grass. Looking further ahead, Mr Hickson says: “If ewes get a little extra attention in the four to six weeks after lambing they will be better able to rear their lambs. Much depends on individual situations, but I feel it is always worth using a creep feed for early-born lambs. It may cost about £10 per lamb, but the lambs will finish earlier and probably be worth about £20 each more than if sold later. “Having ewes in good condition also means they may be sheared earlier and, with lambs gone, have more time to be in best condition for tupping. A little extra attention after lambing has benefits throughout the year.